Q: Hey guys! I’m a Spotify Free user. Any idea if there is a way to download music from Spotify so that I can play it offline with Windows Media Player? Thank you! A: Firstly, Spotify is a streaming music service. Strictly speaking, you are unable to download any songs from Spotify. Secondly, “Offline Play” mode is limited to Spotify Premium users only. Thirdly, Spotify songs are all in encoded format, for which they can only be played with Spotify App and can’t be enjoyed on any other media player on your computer. To sum up, to download music from Spotify and play them on Windows Media Player, in principle, is impossible. But in this post, we are going to make it possible. 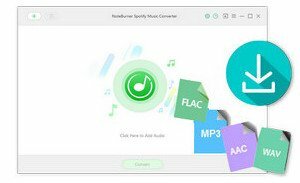 To play Spotify songs offline on MP3 player, Windows Media Player or any other device, all you need is a Spotify music downloader, to convert Spotify songs to MP3, AAC, FLAC, WAV or any other popular formats. Next we are going to show you how to download music from Spotify to your local Windows PC. 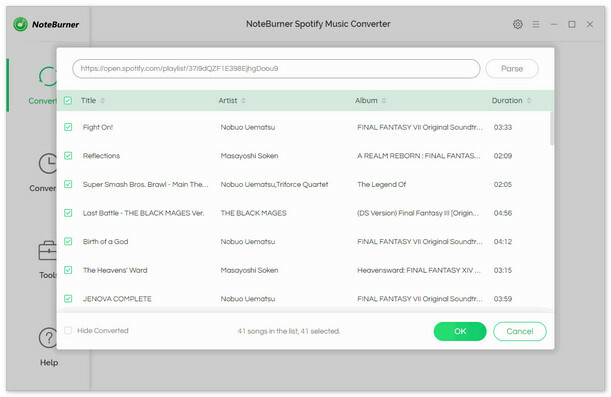 NoteBurner Spotify Music Converter is a professional DRM removal tool specially designed for Spotify users to download and convert Spotify songs, albums, or playlists to DRM-free MP3, AAC, FLAC or WAV format. By adopting an advanced DRM decrypting technique that differs from traditional software, it can keep the original audio quality and retain ID tags after conversion. 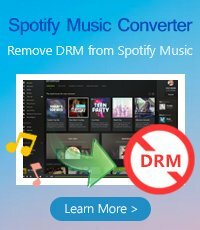 The following is a step-by-step guide on how to download music from Spotify to Windows PC with NoteBurner Spotify Music Converter. Please make sure you’ve downloaded the Spotify music downloader to your computer before we get started. Note: If you are a Mac user, please refer to How to Download Music from Spotify on Mac for detailed steps. Launch NoteBurner Spotify Music converter. Click "Add" button on the upper left or click the center of NoteBurner. 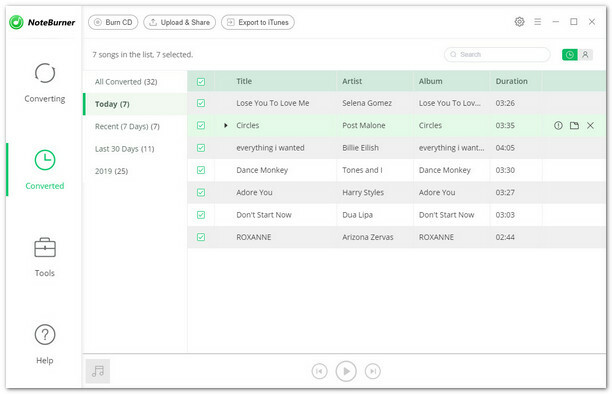 There will be a pop-up window prompting you to copy & paste / drag & drop the song / playlist link from Spotify. Click “Settings” button on the upper right. Here you can choose output format (MP3/ AAC/ FLAC/ WAV), output quality (High 320kbps, Medium 256kbps, Low 128kbps), conversion speed (up to 5X) as well as output path. 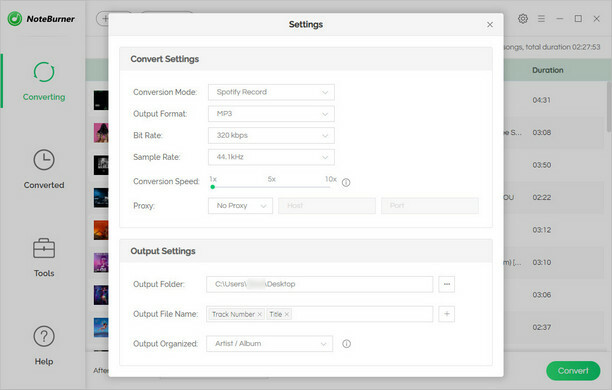 Click "Convert" button and the Spotify song or playlist you selected in Step 1 will soon be converted and downloaded to your local computer. When the conversion is done, click “History” button on the upper right and you can check all the songs that have been converted successfully. 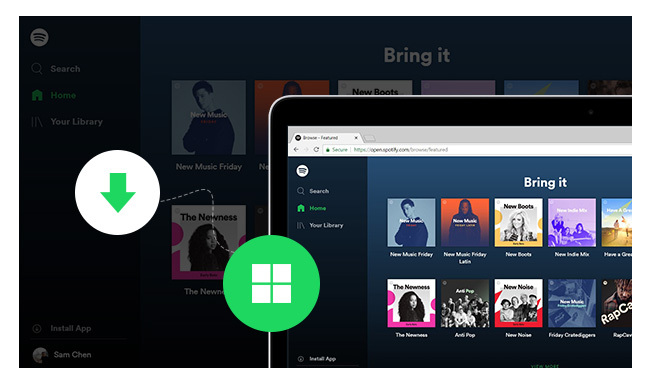 Now you can enjoy your Spotify songs offline, play them on Windows Media Player or transfer them from your PC to any other devices as you wish.